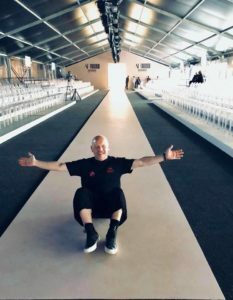 Aubrey Loots on the runway pre-show in South Africa. The only thing Aubrey Loots is more passionate about than the fashion of hair styling is educating and inspiring hairstylists around the world. As an educator Aubrey draws on his 23 years of experience styling and working on runway shows, fashion shows, and Red Carpet Events in New York, Paris, London, Korea and more. Just in the past few months, Aubrey has worked on Behind the Chair’s hair show in Texas, led Wella’s styling team for African Fashion International’s Cape Town Fashion Week in South Africa, and presented at Wella’s TrendVision in Tokyo. While in Tokyo, he also hosted his own week-long Creative Retreat where he taught and set up a photo shoot for stylists, led tours of top Tokyo salons and explored the culture through food, art and shopping. 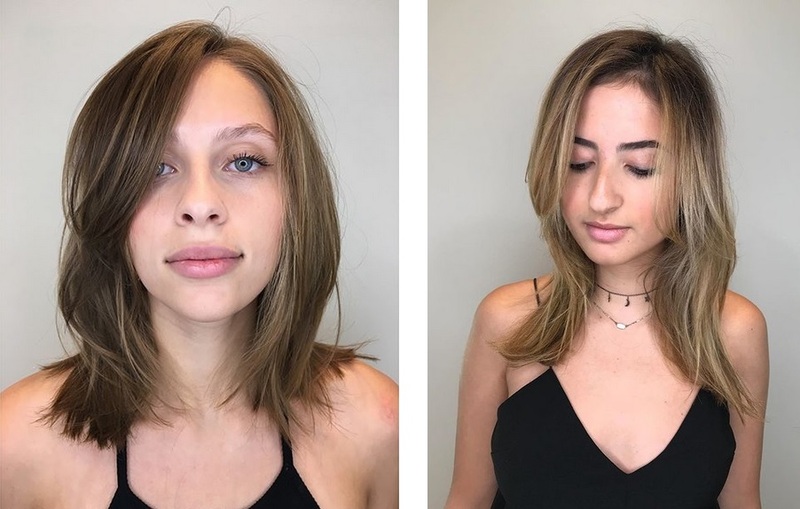 At Samuel Cole Salon, Aubrey’s Master Color Workshop emphasized the art of color placement, strategically lightening pieces of hair that frame the face and therefore creating a major impact. Aubrey’s “express brightening” technique achieved a brand new look in a shorter amount of time and would benefit anyone who desires a little extra drama between their routine maintenance appointments. Natural Beaded Row extensions are the most gentle on your hair. A weft of hair is attached using a bead and string method, allowing natural hair to grow and stay strong and healthy. Appointments to move up the extensions are recommended every 6-8 weeks and are the shortest maintenance appointments among all extensions types. Hand-Tied Extensions are thin wefts of hair that lay flat against your scalp and hand-tied to you natural hair. These extensions are the best option if you’re worried about the extensions blending with your natural hair because there is no bead or tape required. Appointments to move up the extensions are recommended every 6-8 weeks. Tape-in Extensions are strips of hair ranging in width from a quarter inch to two inches to customize placement and limit visibility. Tape in extensions add volume and length to give your hair more body. The best type of extensions for an individual is determined by personal preference, lifestyle and maintenance routine. Schedule a consultation today to find out which type is best for you! Follow Our Natural Beaded Row and Hand Tied Certified Stylists! Follow Our Bombshell Extensions Co Educators! Stevie Smith brought fresh inspiration from Wella’s coveted TrendVision Awards competition, which celebrates exceptional hairdressing talent and creativity across North America. Each year, TrendVision provides stylists the opportunity to engage with the latest trends in styling to take hair artistry to the next level and showcase their skills in live competitions to advance their careers. 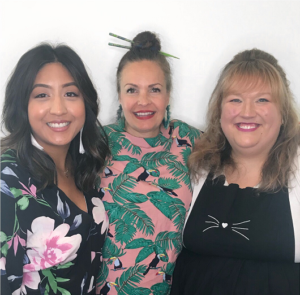 In her Creative Color Workshop, Stevie Smith shared advanced color formulations and custom patterns that pushed stylists to expand beyond the natural shades of everyday hair color. Stylists got creative with artistic concepts such as placing cool and warm tones of brunettes and reds together. She demonstrated how carefully chosen monochromatic nuances can soften a statement of color and create a beautifully harmonized look. 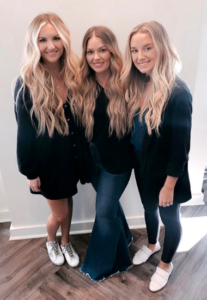 Samuel Cole Salon hosted Hairtalk Extensions Master Educator Tucker Cinalli in a hands-on educational event dedicated to the entire extensions experience, exploring the range of possibilities that hair extensions can offer. Whether looking for length and thickness or a fun new color, Hairtalk Extensions have an answer. Made with Remy Human Hair, the most luxurious type of extension hair, Hairtalk transformations deliver results while looking completely natural. Innovative technology in Hairtalk Extensions create the illusion that the hair is growing directly from the scalp, ensuring that the tape is completely undetectable and leaving you worry-free! Hairtalk extensions come in several options – lengths, tape widths, and color shades – to provide the most customized extensions experience. 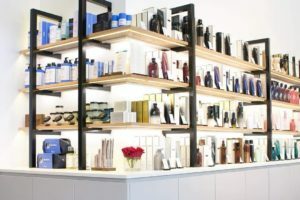 Samuel Cole Salon hosted Gardner Edmunds to teach Oribe’s Signature Cut, the haircut that serves as the foundation for Oribe Hair Care’s cutting philosophy. Gardner Edmunds has worked with top industry professionals and his expertise in precision-based scissor and razor cutting is highly sought after. He has traveled and taught at numerous hair shows and seminars across the country, and his clientele includes Olivia Palermo, Rebecca Minkoff and Kelly Ripa. Oribe’s Signature Cut is an amazingly transitional haircut, so it’s perfect for anyone who wants to grow out their bangs, or who feels like their long hair “drags down their face.” This cut creates strong, blended layers that frame the face while maintaining length overall. The look has texture, movement, and softness created without using a razor. Find this post on Instagram to enter our giveaway!